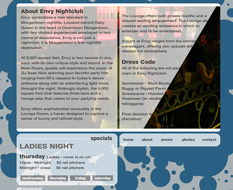 Envy Nightclub is a brand new nightclub in downtown Morgantown, WV. 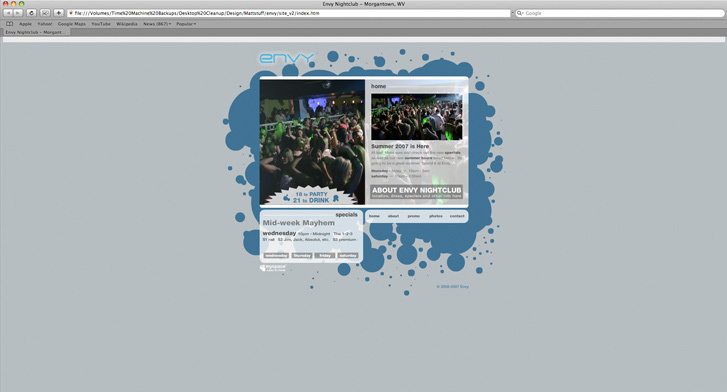 Being a new Nightclub in the sea of bars and clubs that is downtown Morgantown, Envy plans to set themselves apart by putting the emphasis on the nightclub aspects of their establishment. 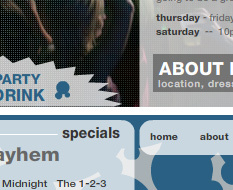 Other than the club’s specials and events, the content that was going to be updated on a regular basis were images. The client wanted an organized photo album so club-goers could check the site the day after their visit and not only see high quality photos of themselves, but download them to share with friends, upload to their myspace, etc. Based on the client’s requests, I decided to create a full flash website to take advantage of Macromedia’s powerful software. The site’s circular theme was inspired by the nightclub’s polished aluminum interior, as was the color scheme. A full-featured audio player, smooth transitions between each page, and subtle animations were also elements added to the final version of the website. The website it no longer active, but all photographic images were created by yours truely.